Heart Disease – Cardiovascular Associates, P.C. Atherosclerosis is the deposition of cholesterol-containing plaque in the arteries of the body. It is more commonly described as hardening of the arteries. It is a systemic disease. Atherosclerosis can involve any of the arteries of the body: arteries to the heart, brain, kidneys, intestines, or legs. The result is a progressive decrease in blood supply to the affected organ. We do not know the cause of atherosclerosis. We do know several risk factors associated with the disease. The most important of these are genetic pre-disposition, tobacco use, hypertension, diabetes and hypercholesterolemia. When atherosclerosis involves the heart arteries, there may be insufficient blood supply (ischemia) to the heart muscle. Initially, there may be sufficient blood supply for the heart when the body is at rest. However, with exercise, there may not be enough oxygen supply and ischemia results. Typically, this results in angina. Typical angina occurs with exercise, stress, following eating or on exposure to cold. The pain is usually described as a pressure sensation extending down the left arm or up into the jaw. Normally, the pain is relieved with rest or with nitroglycerin. As disease in the heart arteries progresses, pain may occur with minimal exertion or even at rest. Eventually, there may be a total occlusion of the artery involved (often by a clot) and a myocardial infarction (heart attack) results. This is the irreversible loss of function of a portion of the heart muscle because of prolonged loss of oxygen. The most common valves of the heart to be involved with disease are those on the left side of the heart. Valves can be defective because of birth defects, infection or as part of the aging process. The valves are one-way doors of the chambers of the heart. When they fail to open completely (stenosis), the heart must pump harder to move blood through the heart. When the valves leak (insufficiency), the heart must pump the blood an additional time increasing the work of the heart. The heart rhythm is controlled by an automatic pacemaker located in the heart tissue which receives input from the brain and hormonal systems. In some patients, the heart rate is too slow or the patient has rapid rhythms which require medication to slow the heart so that the normal rate is slower. 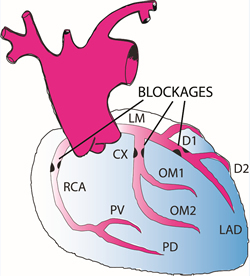 For other patients, there are other locations on the heart which generate a rhythm in place of the normal rhythm. Often these abnormal rhythms are not effective in producing a good blood pressure. Atrial fibrillation (Afib) is the most common heart rhythm problem in the United States. The upper chambers of the heart beat so fast they can only quiver. Due to the heart’s improper pumping function, blood is not completely emptied from the heart’s chambers causing it to pool and sometimes clot. This clot can then dislodge and result in a stroke of the brain. Treatment may include drug therapy, percutaneous intervention or ablation, and surgery including the Maze procedure.